I recently took possession of what is, basically, the largest pen ever. I’m not entirely sure why I did: I did want to try writing with a really fat pen, as people say that they’re more comfortable, and the Tombow Egg Pen is not available as a fountain pen any more. I ordered it from Andy’s Pens, which, while it might not look that modern and requires you to email the owner to order rather than having shopping carts and other e-commerce widgets, is a terrific site, with a huge variety of popular and obscure makes at good prices. I got a response to my email (sent in the middle of the night) in the early morning and had completed the transaction within minutes of reading it – the pen arrived the next day. It’s a pity that the design might put off some customers. I ordered the black model with the “Bakul” finish and the standard Wality nib. I’ve had Wality nibs before, and they’ve been fine, so that didn’t bother me, and I liked the idea of the enormous capacity of the eyedropper chamber to go with the enormous size. The body of the pen is hand-made ebonite, and the Bakul finish is a slightly rough texture that’s given to it which is then polished to be quite smooth to the touch – if you have used a Lamy 2000, it looks and feels a lot like that. 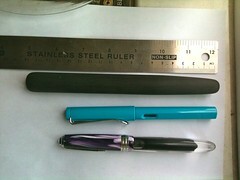 It really is an enormous pen, mostly due to the huge size of the (screw) cap, which makes up about half the length – it is far larger than it needs to be to protect the nib. This makes it very easy to unscrew the two no matter how cack-handed you are, and very hard to lose the cap, two good aspects as far as I am concerned. It’s very easy to open and close as long as you have two hands free. There is no clip and the only visible feature is a breather hole in the cap – both a minimal and maximal pen. The pen is is surprisingly light in the hand – the site says it is 50g when full, which isn’t much, and that includes the cap, which you won’t have in your hand when writing. It is not easily pocketable unless you have ridiculous clown pockets, but it fits into bags easily enough. This model of the Gajendra is an eyedropper filler, which means that the whole back section is an ink reservoir, which you fill using (traditionally) an eyedropper1, one of which came with the purchase. 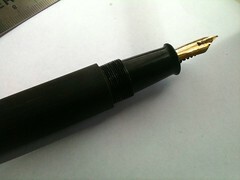 The reservoir holds 7ml or more of ink. That is a lot of ink and you will not, in practice, run out. For tests I loaded it with good old Noodler’s Bulletproof Black, and have had no trouble with this: the flow is fairly generous but not too wet, I’d say slightly on the wet side of average. It does have a tendency to be a little dryer than normal when starting up after being left for several hours; this is easily dealt with by re-priming the nib (i.e. unscrew it slightly, turn it upside-down and screw it up again – air in the reservoir forces a little bit of ink through the feed) or just by writing with it a bit. The F Wality nib was smooth out of the “box”, though, being the picky2 sort of person I am, I smoothed it a little with a nail shaper to suit my preferences. It’s the same nib that was in the Airmail 69L that I’ve written about here previously, and that was also good (the one on my Airmail was better actually but stock nibs do vary ever so slightly). Normal people would not have to do this; I didn’t have to with the Airmail at all. Why would I own this pen? The most obvious target audience for a pen like this is people who prefer fat pens, either because they just like writing with and holding fat pens, or for some sort of medical reason – and there are a significant number of fountain pen users who fall into the latter category, from arthritis, RSI or whatever. Not only is it a tough and good-sized pen to hold but it is also easy to manipulate in almost every circumstance except filling, and you’d only have to do that every few years. Even without these reasons, I’ve been using it as a standard writing pen for a few days now and it’s a generally very pleasant thing to write with. It’s much lighter than it looks, it is easy to grab and unscrew even when half asleep, the nib is well balanced in size, it is not going to suddenly run out of ink, and it isn’t going to break if you step on it. You may hurt your foot but the pen will be okay. The whole thing is extremely simple in structure, as is standard for eyedroppers, and there are no fiddly bits which will ever need work; the nib is pretty much all that would ever be likely to need changing. 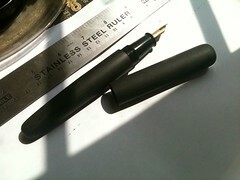 It isn’t a good pen for people who want to show off, because it’s very subdued in design. At least, the black one I have is; they do come in colours as well, but nothing terribly flashy, and by design there is a complete lack of ornamentation. Despite the size I think it is very elegant. It could be a talking point when used in public, I suppose. 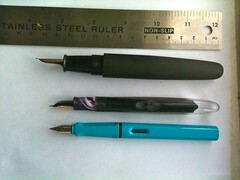 It is also not a terrific pen for people who will want to cap and uncap it to make rapid notes. Not only is it large, the cap screw is quite long. One could certainly use it in a meeting but would not want to fully screw up the cap between periods of writing. This would work. I will try it next time. The answer to this question is “no”. If you sit in the hot sun writing with it, expect to see the line get wetter and wetter and eventually, some ink blob out onto the page. So don’t do that. I’ve not found it to blob just from the heat of my hand though – the ink level would have to be pretty low for it to do that.